Are you ready to start singing Christmas songs or looking for a new CD for holiday road travels? A fun addition to your Christmas CDs is the Kidz Bop Christmas Wish List , it has fourteen classic songs song by kids just for your kids! All Kidz Bop CDs are a must in my house. I have a pile in my console and even have the Kidz Bop station programmed into my car. We spend a lot of time in the cars during the holidays! Christmas shopping, visiting families, friends, etc. can wear on the kids and cause nit picking. Put in the Kidz Bop Christmas Wish List CD and instead of bickering, listen to them sing along with some great songs! Purchase Kidz Bop Christmas Wish List on Amazon for $10.61 & FREE Shipping on orders over $35. These Christmas songs are already kid friendly, but if you are unfamiliar with the Kidz Bop line, they take popular/hit songs and make them safe for kids to enjoy and sing along. ARM & HAMMER™ Tooth Tunes™ toothbrushes feature one of a kind Music in Your Mouth technology that stream sound vibrations from the bristles of the toothbrush through the teeth, allowing kids to hear music while they brush. It is like a private concert in their mouth! In my house there is usually booty shaking and dancing while they brush too. Each toothbrush plays music for two minutes to encourage longer brushing and ensure that kids achieve the dentist’s recommended brushing time. ARM & HAMMER™ Tooth Tunes™ will encourage kids to brush longer while they rock out to their favorite songs. My daughter is in love with these toothbrushes. I love how the song last for the perfect amount of time, but if your daughter is a Kidz Bop fan like mine, then she will be pressing it a second time. There will be no more yelling that they did not brush long enough with these toothbrushes! 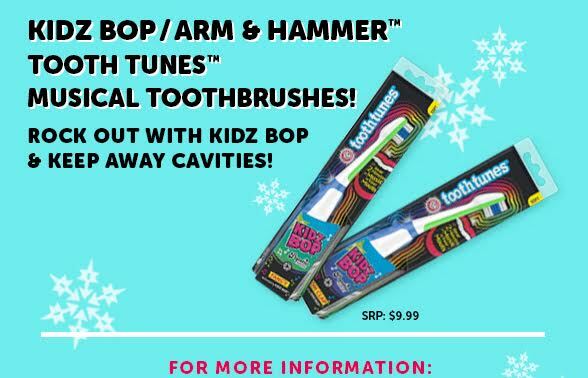 Pick up the Kidz Bop Popstar Series Tooth Tunes this year for the stockings! KIDZ BOP is the #1 music brand for kids ages 5-12 in the U.S., featuring today’s most popular songs, sung by kids for kids. KIDZ BOP celebrates the authentic voice of kids across the entire brand—through music, videos, live appearances, licensed merchandise and its popular social networking and content sharing website, KIDZBOP.com. KIDZ BOP CD titles have earned one Platinum® and nine Gold® certifications since their debut in 2001. Check out KIDZ BOP’s new weekly radio show, KIDZ BOP Block Party!, a two-hour weekly radio show on Kids Place Live, every Friday at 6PM EST. KIDZ BOP is also home to KIDZ Star USA, America’s biggest online talent search for kids 15 and under.